With four keno variants on offer and several different currencies, Wintingo is a great site to play real money keno. Operating since 2011, European players frequent Wintingo regularly and we can see why with a range of other top casino games available too by the top providers Microgaming and Net Entertainment, as well as unique developers Pariplay and iSoftbet. No download required at Wintingo casino. Since keno players are considered casual punters we don’t want to spend time downloading a casino client. Wintingo runs entirely on flash technology so you can access the casino catalogue via your browser. Safari, Chrome, and Firefox are among the popular browsers used to access the casino. This also means Mac users can access the catalogue – downloadable software generally isn’t compatible with Apple devices – as well as mobile users with the site optimised for smartphones and tablets. New player bonus at Wintingo. Keno players are lucky when it comes to online casino promotions as they, along with pokies players, can clear the wagering requirements, which come with the bonuses, easily. 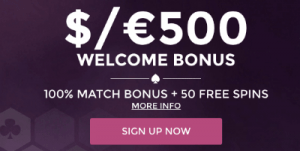 Wintingo offers a $500 welcome bonus for new players over five deposits – you will receive up to $100 matched by 100% for your first five deposits. There’s a 40x wagering requirement which you can clear playing keno with 100% of the keno bets contributing to the turnover requirement. You can also claim 50 free spins for Starburst with the welcome bonus – enter the STARBURST50 if depositing on desktop devices or the code STARRAIDERS50M if you’re on a tablet or smartphone. Another advantage of being a keno player is you can accrue loyalty points at online casinos as quick as pokies players, and quicker than table title gamers. For every $1 wagered on the keno games at Wintingo you will receive one Rewards point – the fastest way to earn points. When players first sign up with Wintingo you are awarded with 2500 loyalty points to get you started. This will set you off the in the Blue tier of the loyalty program, with Bronze, Silver, Gold and Diamond available to climb. Once you get to Gold status, which requires 7500 points in one calendar month, you will receive 10% faster paybacks and special benefits. Diamond offers 30% accelerated earning and special bonus specials too. 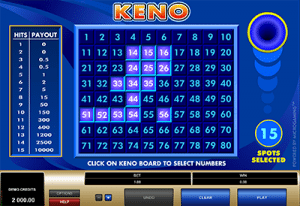 There’s four keno games available at Wintingo with three offering unique gameplay you may not have seen before. Created by PariPlay, players can try out this 80 spot variant at Wintingo, which is set on what appears to be an electronic arcade game, similar to a pinball machine. Players can pick up to 10 spots, with the paytable to the right of the game. This title offers a huge range of limits from a minimum of $0.10 and a maximum of $300 – we are yet to find an online keno game offering such huge limits. Players can pick to play five or 10 games automatically, or play a new game each time using the Play button. There’s also the AutoPick button which will pick all 10 numbers for you. When you press ‘Play’ two cannons will pop up and start spitting out balls – winning balls will turn orange and you will be paid accordingly. The Return To Player for this title is 90%. Magic Keno by PariPlay at Wintingo. 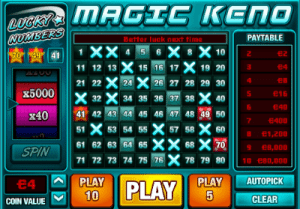 Another keno creation by PariPlay is Magic Keno offering similar gameplay to Super Keno but with an electronica theme. The same minimum bet of $0.10 and maximum bet of $300 is available here too. Players can bet up to 10 numbers from 80 but what makes this title unique is the addition of the Lucky Numbers feature on the left side of the game screen. When you bet all 10 numbers three bonus numbers will appear in the three Lucky Number spots once you’ve pressed the ‘Play’ button. If you match the three numbers the Spin button will be enabled and you can click it to reveal a multiplier which will be applied to your winnings. This variant features a theoretical Return To Player of 90%. 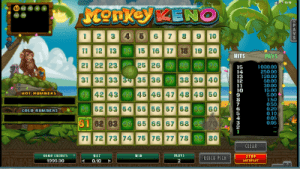 Monkey Keno by Microgaming at Wintingo. This version is a brand new title from top software developer Microgaming and is quite entertaining thanks to the swinging monkeys which hang around next to the game layout, with the main money throwing out coconuts when you play each game. Limits are kept quite low here – a minimum of $0.10 is available while the maximum bet is set at $10. A unique feature to keno with this title is the ability to AutoPlay games up to 100x or until stop – generally you can only play five to 10 cards. You can also indicate if you want each AutoPlay game to have new numbers which will be chosen via QuickPick. There’s 15 spots eligible to be picked from 80 and 20 are drawn with winning numbers lighting up and payouts credited to your account accordingly. Monkey Keno has a theoretical RTP of 94.90%. Keno by Microgaming at Wintingo. Players can pick up to 15 spots, with 20 drawn from 80 and winning numbers lighting up in orange. There’s no AutoPlay or QuickPick options and the graphics are quite bland – but this title is perfect if you want a simple keno board and standard payouts. Microgaming’s Keno has a theoretical RTP of 94.90%. 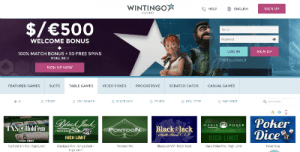 There’s over 900 other casino games available at Wintingo from pokies to table games, as well as progressives, scratch cards, video poker and other casual games. The games are provided by Microgaming, Net Entertainment, iSoftBet and Pariplay and Wintingo offer game filters to make searching for titles easier. Wintingo also offer Evolution Gaming’s suite of live dealer games including live roulette, blackjack, baccarat and poker variants. Dealers are streamed in real time to your device so you can play land-based casino games guided by croupiers from the comfort of your own home. Use the chat box to talk to other players and the dealer, who will respond verbally, giving you asocial experience. Play casino games at Wintingo on your mobile. Despite a mobile icon on the Wintingo desktop version of Microgaming’s keno variant indicating it is available on smartphones and tablets – we couldn’t find it using our iPhone. 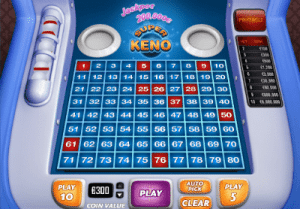 We could find a range of pokies, progressives, blackjack, roulette and other table games and even a bingo variant but keno isn’t available for mobile players at Wintingo. 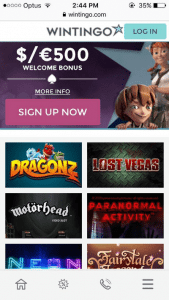 If you want to play other casino games on your Android, Apple, Windows or other portable devices. You can sign up using your device or use your login details from your desktop-created account.